So lets start with what the heck are we talking about here? Fuel injection is the system that gives the engine the fuel it needs to run. It’s responsible for giving the engine just the right amount of fuel at just the right time. Too much fuel, too little fuel, or fuel at the wrong time or delivered in the wrong way are all bad things for your engine and if any of these things happen, you will know it in the form of a rough running engine, low power, or an engine that just simply will not run at all. Now that we have that out of the way, lets talk about the 2 major kinds of fuel injection and just exactly why it even matters to someone who really just doesn’t want to think about it. PFI (port fuel injection), which is the older system, and GDI (gasoline direct injection), which is the new technology, are the two kinds of fuel injection systems in use today on gas fueled engines. The major difference between the two is the placement of fuel injector and the fuel pressure required to operate the system. In a PFI system, average required fuel pressure is anywhere from 35-60 PSI depending on the system. This system uses one fuel injector per cylinder. So if your engine is a V-6, you would have 6 fuel injectors. if it was an inline-4 cylinder, you would have 4 injectors, etc. The fuel injector is an electrical on/off valve if you will that when electrical power is applied, the internal valve opens and fuel is sprayed out. When the electricity is removed, the injector valve closes and fuel spray stops. This on/off happens very quickly. The amount of time the injector valve is on, or open, is measured in milliseconds. Sometimes single digit milliseconds. For reference, there are 1000 milliseconds in one second. That’s quick! The PFI fuel injector is located in the engine’s air intake manifold and is directed at the back side of the cylinder’s intake valve. We will discuss why the injector’s location is important a bit later. A GDI fuel injection system is quite similar to a PFI system. Like the PFI system, the GDI system uses individual injectors for each cyllinder, they are electronically controlled and function much the same as the PFI injectors. The differences are that a GDI fuel injector needs upwards of 2000 PSI of pressure under heavy load operation. This requires a special mechanically driven fuel pump to produce that much pressure. The other significant difference is the injector location. Unlike the PFI system, where the injector points at the back side of the intake valve, the GDI injector is aimed directly into the combustion chamber, or cylinder as it’s more commonly known. The PFI system on the left has the yellow injector above the valve. The GDI system on the right has the yellow injector below the valve, directly into the cylinder. The injector’s location change is significant because fuel itself is a great cleaner. Because the injector in an older PFI system sprays fuel directly onto the intake valve, as seen above on the left, it is constantly cleaning carbon and build up off of the valve. The newer GDI injector is located after the valve as seen above on the right, directly in the cylinder therefore no fuel ever touches the valve and this allows large amounts of carbon build up to accumulate. When the carbon build up gets to the point that it interferes with the valve’s ability to seal on its seat, engine misfire and roughness begins to occur. If the build up gets too bad, the only way to remove it is to completely remove the intake manifold and use special media blasting equipment to blast the carbon build up off the valves and intake ports. In extreme cases, the cylinder head will need to be removed to remove the valves and replace them. This can be very expensive and is completely avoidable with regular induction cleaning services. This photo shows on top, extreme carbon build up on the valves. On bottom, you can see what clean valves should look like. We recommend on a GDI engine to have this service performed every 15,000 to 20,000 miles. Yes, that’s right. Carbon can accumulate to the point of causing runnability issues as soon as 40,000 miles. 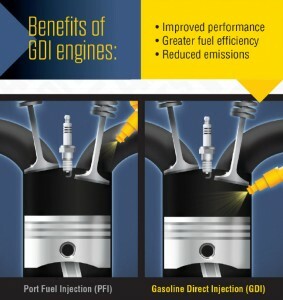 GDI systems offer greater fuel economy, more precise fuel delivery and more engine power. The trade off is some extra maintenance needs to be done to keep this system in top operating condition. If you are unsure if your car or truck uses a GDI or PFI system, we are here to help! Visit www.auto-go.net or call us at 417-272-0091 and we will be happy to discuss this with you and determine your engine’s specific maintenance needs! The weather is heating up quick. It’s almost like we missed spring altogether.. We had snow in April and 90 degree temps in May.. Welcome to the Ozarks. With the temps going up that means you will need air conditioning in your vehicle. The hot Ozarks summers can produce triple digit temperatures with humidity percentages approaching the same, and that’s just plain nasty. We usually take the operation of our car’s A/C system for granted as long as it’s working. But when it quits and the nice, dry and cool air turns hot and sticky, we take notice quickly and often times the repair bills for restoring the comfort can be substantial. So what can you do to give your car’s comfort system the best chance for long and trouble free operation? First lets dive into just what an A/C system is made of. That’ will help us better understand what we can do to keep the air cool. So what usually goes wrong with these systems? The most common problem by far is refrigerant leakage. If the magic voo doo chemical leaks out of the system, then it just plain won’t work. Sometimes the leak can be a very small, slow leak that can be next to impossible to find. In that case the system is charged and UV dye is added to the system so that the leak can be found next time with a black light. Sometimes the leaks are east to fix such as a failed o-ring at a line connection. Other times it can be quite expensive should the evaporator behind the dash be leaking as the entire dashboard has to be removed in many cases. Other less common problems include failed compressors, failed cooling fans, failed blower motors, broken compressor drive belts, among other things. So what can you do to help your A/C work as long as possible? The honest answer is not a whole lot. One important thing to remember is that the A/C compressor relies on lubricant that is mixed and circulates with the refrigerant. If the refrigerant leaks, then so does the lubricant and there isn’t any good way to tell how much lubricant remains in the system. There is no dipstick or sight glass or anything really for measuring lubricant amount. The only way to tell for sure that the system has the correct amount of lubricant is to remove every component from the system, flush them out to remove any lubricant and then install the manufacturers recommended lubricant amount. That’s ridiculously expensive and an over or under lubricated system will spell disaster for the compressor. That’s why its important to have refrigerant leaks fixed right away and not continue to recharge the system over and over again. Some other things that are important for A/C operation is a clean cabin air filter, a drive belt that is in good condition. It’s also a good idea to operate the A/C system at least once a month to keep the lubricant properly distributed within the system. If the system sits for long periods of time without use, the lubricant settles to the bottom of the system and creates a dry start situation with the compressor is engaged.